Home Uncategorized CAHT Welcomes New President! At the December board meeting of the Campaign Against Human Trafficking – SouthShore the board members were pleased to install a new president, Annie Garrison (on the left in the photo). Annie is new to the area but definitely not new to the non-profit scene, having spent most of her career working with a variety of non-profit organizations. Some of these include serving as executive director of a downtown association and owning a boutique image communications firm that specialized in non-profits. Annie also served on numerous boards and enjoyed a career in the health field at the University of Virginia. Annie is a graduate from the University of Virginia and her home town is Mercer Island, WA. Her oldest son lives in Sun City Center and that’s what drew Annie here. She has two other sons, six grandchildren and one new great granddaughter. WELCOME, ANNIE! The excitement of the new president was tempered just a bit with the departure of the CAHT recent president, Joan Kramer. Joan has led CAHT for the past three years. The plight of trafficking victims is always at the forefront for Joan. She has been hands-on with every aspect of CAHT, lending her time and energy to every team. 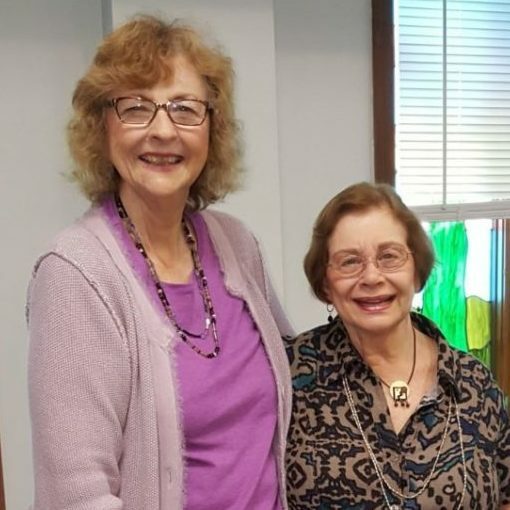 Joan has made many awareness presentations, helped with fundraising, packed backpacks for victims, secured relevant speakers for the general meetings, and much more. Happily CAHT is not losing Joan altogether. She will remain on the CAHT board, sharing her knowledge and heading the Victim Services team. In Joan-like fashion, Joan made her resignation official with a resignation poem that started with “It will soon be evident that I am no longer President”. However, the evidence of Joan’s tenure as President will always be felt in the Campaign Against Human Trafficking – SouthShore. THANK YOU, JOAN!